Q: Why not take surgical removal as the first choice? 1. The first reason is the location of tumor. The back part is cervical vertebra, the top is the skull base, and under the lacerum is hypoglossis, glossopharyngeum, accessory nerve and other important arteries and veins. Nasopharyngeal cancer metastasizes to the brain through these arteries and veins. Therefore, it is quite difficult to perform operation in such a small place that full of important nerves. Moreover, it is impossible to perform operation without hurting other important tissues. 2. The difficulties and limitations bring by the quick development of tumor. The tumor enlarges to the middle cranial fossa and causes damage to the cranial nerves. Its metastasis rate is up to 60%-80%, it can metastasize to the lymph nodes, brain, neck and liver, etc. 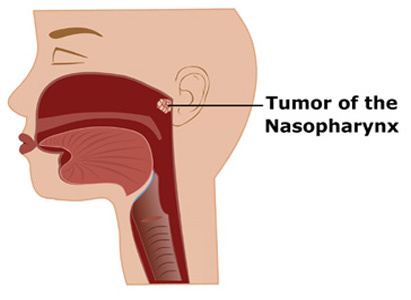 Nasopharyngeal cancer usually is malignant undifferentiated or poorly differentiated tumor; only 4% to 7% are detected at the early stage. Most patients were diagnosed at the middle or advanced stage. Q: What kinds of diseases are easy to be confused with nasopharyngeal? Lymphoma is common in young people. Primary lymphoma is bigger, usually accompanied with serve nasal obstruction and symptoms of ear. Lymphoma can not only metastasize to the lymph nodes on the neck, but also other lymph nodes in the whole body. The cranial nerve injuries caused by the lymphoma is less than nasopharyngeal cancer. Patients need to be examined and diagnosed. Single or multiple nodules appear on the top, posterior and side wall of nasopharynx, which is red, smooth and looks like small hills. The nodules usually develop based on the mucous membrane of nasopharynx and adenoid, some may become retention cyst because of the exuberant secretion of human nasal gland. Patient usually has a history of pulmonary tuberculosis, with symptoms like nasal obstruction, bloody nasal discharge, low-grade fever, night sweat, emaciation, nasal ulcer, etc. Patients may also have lymphatic tuberculosis on the neck, and acid-fast bacillus can be found through excretion smear; enlargement of lymph nodes, tubercle bacillus can be found through lymph node aspiration on the neck.